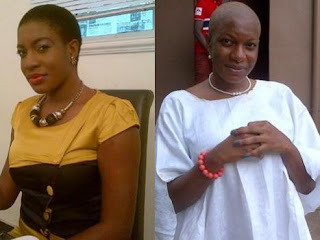 Back in April, Nollywood actress Chika Ike received a whopping N5 million compensation for shaving her head for a special role in Moment of Tears movie by First Movies International Ltd.
As we speak, the dedicated actress appears to be on recovery path. From her previous bald look, Chika Ike now rocks a pretty short crop. In Moment of Tear Nollywood movie, the actress played the role of a widow to veteran actor Olu Jacobs. Dis is serious, jus 2 shave hair and act, u re givin N5million, Nigerian has d wealth but spend it on unneccessary things may God help us. If I comment will you pay me #5M.abeg park well jooor. Bald or no bald u stil look pretty. They re just spend money 2 unnecessary thing, so is bcos som1 cut her hair bcos she want 2 perform a role in a movie…..nawa o may God save us in dis nigeria o! Dis is really serious,just 2 shave her hair n she was given 5million pls did she buy the hair? Even if she those how much is it. Nigeria when wil u b good. 5 million even small,y dem no make am 15 million……gush! Was it used for rituals??? She should tank God dey gave her 5million if it was me may be i wud do more dan that . She’s still ma gal any day. Still ma gal any day. Pls is dis for real? « Governor Rotimi Amaechi Still Dances Azonto Even In Troubled Times!